In a later post, the husband will write about all the, shall we say, interesting tapas we ate while in Madrid. When I use the word interesting, I mean that many may find some of these tapas to be gross and/or bizarre. Personally, I am always willing to try something new. Only then can I make an opinion about it. Like I say, deep fry some cow balls and cover it with a cream sauce – well, I’d try it! But today’s post is not about the bizarre foods we ate in Madrid – it’s about the tame ones. Even some of the ‘weird’ ones we ate became tame in my mind after we ate them. Everything in Madrid is just so damn delicious. 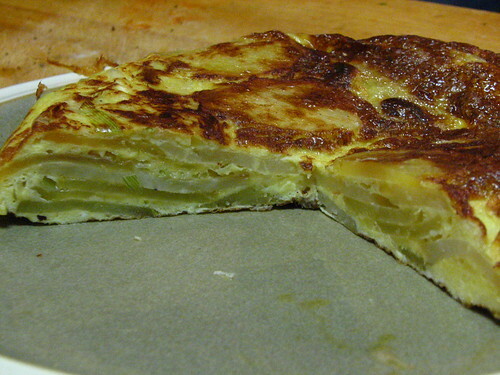 I’ll start with the crowning jewel of Spanish tapas – the Tortilla Espanola. This is the quintessential tapas and you will find it all over the country (unlike some of the regional tapas you only find in specific areas). According to Penelope Casas (author of the excellent The Food and Wines of Spain), the tortilla is “a way of life in Spain and loved by all”. She also explains the meaning of the word, which many confuse with the Mexican “tortilla”. The only thing these two things have in common is it’s shape which comes from the Latin torte, meaning a round cake. Tortilla Espanola is one of those meals that you think should be easy to prepare – it’s a freaking omelet, right? WRONG. The key to this delicious and simple treat is how it’s cooked. It takes time, folks. It has simple ingredients, but is not as simple to prepare as you may have though. This should not scare you off! But do what we did – make a big one on a Saturday morning and eat small slices for the next day or two (make sure you cover it!). It makes for not only a great snack, but pair it with some bread and a simple salad and you’ve got a meal. 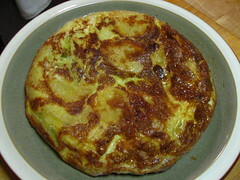 See end of post for our recipe for Tortilla Espanola. 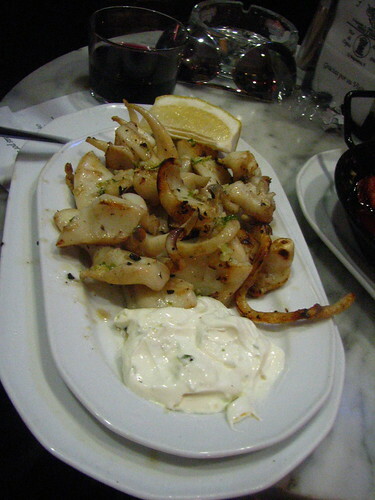 Moving on, some of the other safe, but fabulous tapas we ate in Madrid was Patatas Bravas. Yes, fry anything and top with a nice sauce (see my cowballs comment above) and I’ve got a smile on my face! 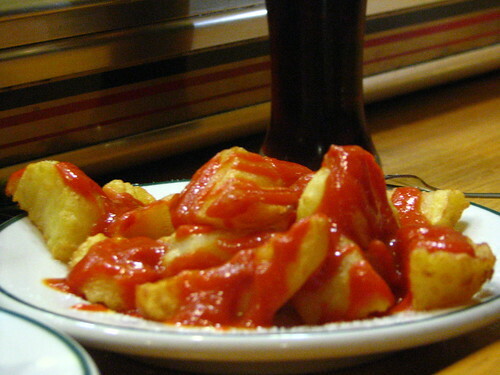 Patatas Bravas are simply fried potato wedges (or squares) topped with a spicy pimenton (pimento) sauce. They are eaten with toothpics and are the perfect tapa, or snack, to eat with a refreshing Mahou beer. We almost ate at the supposed birthplace of the patatas bravas, but was turned off when we walked by, saw it and also realized it was a chain-restaurant. There are many tapas places to eat in NYC (none I’ve found to be anything like the ones I’ve eaten at in Barcelona, Basque Spain or Madrid) and most of them will serve the bravas. Next up, albondigas. Another famous, in-every-single-tapas-bar-in-NYC-tapa. 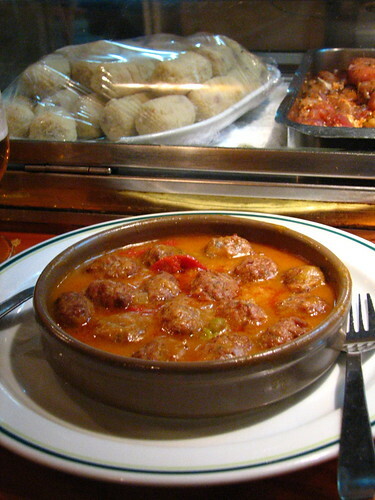 BUT, the one we ate in Madrid beat every albondigas I have eaten anywhere else. The sauce that came with these tiny meatballs tasted like a sweet tomato/pimenton sauce. I’ve had it with a brown sauce, with an onion gravy and with a chunky tomato sauce. This did not taste just like tomatoes. Regardless, it was heavenly and I ‘shwooped’ up all the sauce with the bread provided to us. Now, another shining star of the tapas world – chorizo. OHHHH BABY. 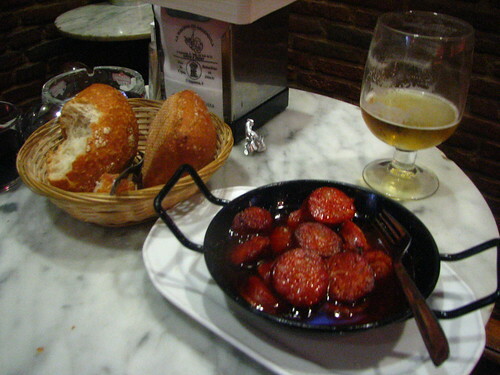 I shiver with happiness when I think of eating this – especially the way we ate it in Madrid in the above picture, Chorizo al Vino Tinto (chorizo in red wine). The chorizo we often buy in the store in America is the Goya-brand chorizo. It is hard and cured. Although it’s got all the right ingredients (pork, chunks of pork fat, pimenton), it is just completely different in look, texture and flavor from the soft, fresh chorizo sausage we ate in Spain. This tapas came out sizzling in it’s own juices and fat with a hint of red wine. Believe me, we used that bread for some serious dipping. I felt like I was dripping in fat when it was done, and, damn it, was it worth it. Finally, another famous tapa/raciones eaten in Madrid is any seafood a la plancha, translating to grilled on a metal plate or cast iron skillet. It’s all about the dry heat cooking the food. You will see gambas a la plancha, camarones a la plancha or filetes a la plancha as well as numerous other dishes cooked a la plancha in Spain. But the sepia (cuttlefish) a la plancha we ate our first day in Spain stole our hearts. It was grilled to perfection and meaty with just the taste of the sea, fresh Spanish olive oil and some lemon juice accenting it’s flavor. Of course I didn’t mind the aioli dipping sauce on the side. Sepia tastes a bit like calamari, but I think it’s much more robust and thicker/meatier. It was heavenly. I wish it was more widely available to make in my ‘hood. Now, I hope you will consider making your own Tortilla Espanola for breakfast, lunch or even dinner… possibly a snack, too? We added some leeks to ours, but traditionally it should only include some onions and potatoes. For brunch, we had a slice with some chorizo, bread and a fried tomato. I hope you enjoy! Make sure your potatoes and onions are thinly sliced – I’m talking about 1/8 of an inch. In a hot, round skillet or pan, heat olive oil and add a layer of sliced potatoes to cover the bottom of the pan. Lower the heat to medium or medium low (depending on your stove) because you want to cook the potatoes slightly but you do not want to brown them. This is key. They will only cook for about 3-4 minutes on each side. Flip over all your potatoes to get the other side cooked. Remove all these potatoes and allow to drain on some paper towels. Sprinkle with some salt. Repeat this method with the rest of the slices of potato. After the potatoes are completed, saute the thin onions and leeks. This should not take very long since they are so thinly cut – maybe about 3-4 minutes. While onions/leeks are cooking, whisk your eggs. Do not add anything else but some kosher salt. Throw the cooked potatoes into the whisked eggs and allow to settle in until you’re ready to cook the tortilla. Remove onions and leeks and throw those into the egg mixture as well. Heat your skillet/pan to high heat to make sure it’s very hot. Add a good amount of olive oil and turn your pan so that it covers the sides as well. Add your egg/potato/onion/leeks mixture to the hot pan and quickly spread out the potatoes and onions so they cover the circumference of the pan. Turn heat down to medium-low and allow your tortilla to cook. Shake the pan after a minute to aid in the cooking process. I used a fork to “poke” it a few times and ran it around the sides a bit to allow some of the egg to disperse. Do not worry about the tortilla like I did. As long as the pan is hot enough, it will cook evenly. After about 4 to 5 minutes, you will notice that most of the egg on the top will be cooked – some will not – it will still look like raw, whisked egg. Still, you will take a plate, cover the pan (it must fully and tightly cover it! ), and with your hand on the top of the plate, flip the pan to the tortilla ends up on the plate. Add a little bit more olive oil to the pan and then slide the other, uncooked side of the tortilla back into the pan to finish cooking. My tip is to hold back the cooked part until all the uncooked egg is in the pan first. Then quickly add the thicker, cooked part. Allow this to cook for 3-5 minutes shaking the pan again. Traditionally, you should flip it again 2 or 3 times to ‘shape’ it perfectly, but I was too hungry to do so!! ENJOY! I don’t know where you guys are in Brooklyn, but you can get authentic tapas in Williamsburg. We are long-time fans of Chef Diego Gonzoles, now cooking at Zipi Zape. He used to cook at (sadly now closed) Allioli, which was absolutely amazing and earned a Zagats 27. The tapas he serves at Zipi are not as cutting-edge, but are lovely traditional dishes and as good as any you’ll find in Spain. Worth a visit. I noticed you enjoyed seafood cooked a la plancha in Madrid. You might be interested to learn more about Evo – an American-made plancha, perfect for grilling everything…including seafood. It’s settled–I have to make a trip to Spain. I like the idea of leeks in Tortilla Española. @Mike in NJ – thanks for the comment. We’ve actually done it both ways, as above and frying the potatoes ahead of time. We’ve also tried it with left over roasted or boiled potatoes, which seems to work well too. Ultimately, it’s up to you, but I must admit to preferring tortilla made as above – the lack of crispiness in the potatoes allows the quality and flavor of the egg to come through, and texturally, while I usually love crunchy things, I prefer my omelettes smooth. By the way, where was your mother from? Where did she get her recipe? Oh, boy. Just came upon the CSM article about Pincho Moruno and simply had to click through in order to read more on your blog. Loved this synopsis of delectable tapas and am also a big fan of Penelope Casas. I tried to make my first Tortilla Espanol a few weeks ago and oddly – the first one worked like a charm – it was the second go-round (when I foolishly tried to get creative and add cheese) that was a disaster. Delicious, but ugly. It may be that you have discovered a good source for sepia since you posted this piece years ago, but wanted to let you know we have sepia from Spain – comes cleaned and flash-frozen (which is an ideal way to tenderize, according to Miriam Garcia). I’d be happy to send some along to you if you’d like to sample?